STATE COLLEGE, Pa. - Many Penn State fans have become familiar with the annual Beaver Stadium "White Out," as well as the first ever "Stripe Out," which spectators pulled off for the Rutgers game last month. But for Saturday's noon game against Illinois, a group of Penn State alumni and students is gathering support for a "Purple Out' in honor of Penn State alumna Kayla Nakonechni. She died earlier this month at 24 after a two-year battle with brain cancer. I’m writing to you concerning a very important matter concerning the chapter’s finances and fundraising. Our chapter’s primary financial philanthropic focus is an annual scholarship for a local student attending Penn State and a donation to the Nashville Sexual Assault Center. Last year you helped raise enough money to provide $1,000 to each of those causes. To fund our efforts the chapter typically holds a variety of sales and fundraisers throughout the year – the largest contributor is the half-time fundraiser at our football viewing parties. I believe the half-time prize drawing is one of our most popular chapter activities. This week the chapter Board became aware that past half-time fundraisers may not have been consistent with state law. Basically the prize drawing could be interpreted to be a “game of chance” and subject the chapter to harsh penalties. Knowing this, and fulfilling our fiduciary duty to our members, the Board has decided to rethink the manner we operate the prize drawing. Here’s the plan for this weekend’s Michigan game (10/11 @ 6pm CT): every Penn State fan will be given a single door-prize ticket at no cost; at half-time we will draw some tickets; winners can claim a door prize from the stage. Most of this will be very similar to past prize drawings. As you can probably decipher there are costs incurred to buy the door prizes and this method raises no money for our philanthropic programs. Accounting majors may call this a net loss. The chapter will not be able to function long at a net loss. So...to continue our philanthropic efforts the chapter needs more of your VOLUNTARY financial support. Our chapter is a recognized tax-exempt 501(c)(3) organization so any additional money you give to the chapter could be tax deductible. At all future football viewing and holiday parties there will be a “donation bucket” near the store merchandise. I’ll ask you to drop in whatever you can be it a few dollars, the amount you use to spend on prize tickets, or a big check payable to the chapter. If you would like a receipt for your taxes we have those too. You can also support the chapter by clicking a link on our webpage. On Tuesday (10/14) your Board will be meeting to review the Michigan game finances and discuss future fundraising plans. Please know that we will be trying to find a way to maintain the half-time prize drawing but obviously can not continue if there is a net loss every week. I’ll let you know what the future plans are in the OSU game email. As always, if you have questions or constructive comments please contact me directly. For The Glory! 42nd annual Penn State University Football Button Contest Now Open! The 42nd annual Penn State University Football Button Contest, sponsored by Citizens Bank, is now open. This is your chance to submit creative slogans for the upcoming Nittany Lions Football season rivalries. See attached contest entry rules and instructions. Contest deadline is July 13, 2014, 11:59 pm. Please click links to view entry rules and details. 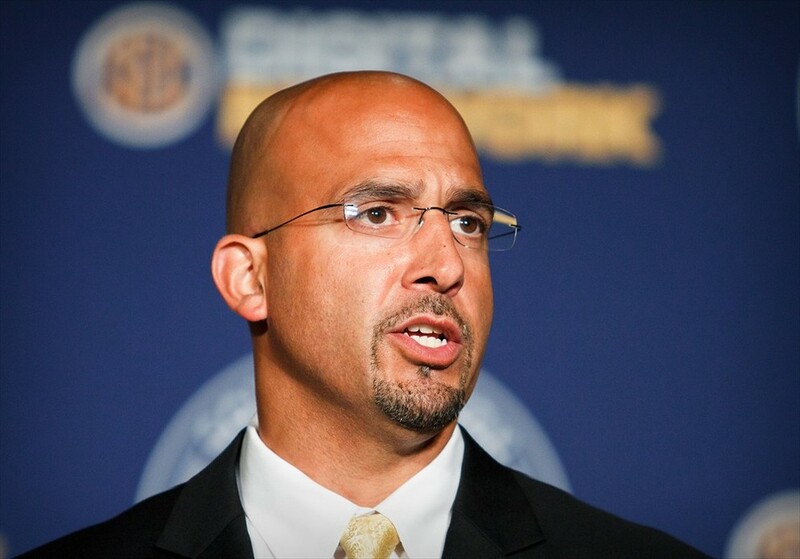 UNIVERSITY PARK, Pa. -- Penn State is scheduled to hold a news conference at 4:15 p.m. on Saturday, Jan. 11. Live video of the news conference will be available at http://video.btn.com/allaccess/?media=426760. The event also will be available on the Big Ten Network's on-demand video portal, BTN2GO. A full transcript of the conference will be posted at http://www.GoPSUsports.com on Saturday evening. UNIVERSITY PARK, Pa. - Penn State officials are gratified by the decision of the NCAA Executive Committee to modify the scholarship limitations previously imposed on the University under the consent decree between the University and the NCAA. This action, announced today, taken in recognition of Penn State's significant progress under and continued compliance with the Athletics Integrity Agreement, grants immediate relief from both the initial scholarship restrictions and overall team limit restrictions previously imposed on the University's football program. This modification will restore a total of 65 scholarship opportunities for football student athletes wanting to attend Penn State. "I am very happy for Coach O'Brien, the football coaches and staff and the players; especially pleased for our current and future student-athletes, who are the most important reason why we love working in intercollegiate athletics. We will continue to work hard within the Athletics Integrity Agreement to fully comply and to achieve excellence in everything we do at Penn State." "Today's announcement by the NCAA is tremendous news. As a staff, we are especially pleased for our players, who have proven themselves to be a resilient group of young men who are able to look ahead, focus and overcome adversity. Penn State has long been known for graduating its student-athletes and providing them with a world class education. The scholarship additions will allow us to provide more student-athletes with a tremendous opportunity to earn that degree and play football for Penn State." "The action taken today by the NCAA, following its review of the positive report issued this month by Sen. George Mitchell, recognizes the significant efforts over the past year to make Penn State a safer, stronger institution," said Penn State President Rodney Erickson. "This news is certainly welcome to our University community, particularly the student athletes who may want to attend Penn State and will now have the means to do so. As we promised throughout this process, we are committed to continuing to improve all of our policies, procedures and actions." Sen. Mitchell is the independent, third-party athletics integrity monitor for Penn State who published a report on Sept. 6 indicating that Penn State has substantially completed the initial implementation of all of the Freeh recommendations and all of its annual obligations under the Athletics Integrity Agreement (AIA). The report includes Mitchell's impartial external review of Penn State's efforts to implement the 119 recommendations made by Judge Louis Freeh in July 2012. Under the AIA, the University was obligated to take all reasonable steps to implement the recommendations by Dec. 31, 2013. The University, the NCAA and the Big Ten Conference entered into the AIA in August 2012 as part of the consent decree imposed by the NCAA. The agreement contains a number of prescriptive measures designed to ensure that the University continues to meet or exceed all applicable NCAA and Big Ten rules and standards of integrity. Erickson thanked Head Coach Bill O'Brien for his leadership during this critical time and for his dedication to his players and to the University through the past two difficult seasons. He also acknowledged the work of student athletes, both on the field and in the classroom. "The resiliency displayed by those young men, as well as our entire student body is something of which we are proud," Erickson said. "I would also like to thank the literally hundreds of University administrators, faculty, staff and students whose hard work over the past 15 months helped lay the groundwork not only for this action by the NCAA but, even more importantly, for a better Penn State."